After a long and wet winter, summer is finally here! Quail Roost has been very busy with lessons and we are excited to have a few new faces in the barn. Carroll Stone does an amazing job with the facility, and I am very lucky to train out of such a top class farm. I have also been busy teaching in Bolivia,NC when I spend time at the beach. Carol Willets has been so accommodating, and I have really enjoyed getting to know the people there. As usual, it is a fine balance between family life, friends, and teaching. Hailey is starting 2nd grade in July. And while daily life is full, I am so fortunate to have her, Chuck, and so many great people in it! Cheers to a fabulous 2018 season! Well the 2016 show season is a wrap! My friends and clients had a busy and successful year, with many forming new equine partnerships and moving up a level. I enjoyed organizing clinics for my friends Phillip Dutton, Boyd Martin and Doug Payne, and was thrilled to see my students thrive at them! Hailey has started kindergarten, and is full of life. She is growing up too fast, and luckily has not caught the horse bug yet! Besides teaching and training, I have enjoyed spending family time at Carolina Beach. There is now a bit of a break for Christmas and New Years, then back to action for the 2017 season. Summer 2016 is finally here! While I am looking forward to much needed beach time, the horse operations are still in full swing. I have added lessons to the program at Willetts Horse Farm in Bolivia, NC, as well as teaching at Equiventure Farm and Portofino. Many of the riders have acquired new horses, and are looking forward to new relationships! My friend Janet von Pressentin has resumed scoping out amazing OTTB's on the west coast. She has found multiple 4 star horses such as my own Last Monarch, Poggio II, Woodstock, Coal Creek, Leyland, and Madison Park. Please email her at jvonpress@comcast.net for more info! Well the 2016 season is underway! Holly and her students will be heading to Aiken, SC for the start of the season. Last year Holly began teaching at Portofino Equestrian Center in Clayton, NC. While she still teaches at Equiventure Farm, Portofino has added more students and horses to the training program. There are a number of juniors and adults at both barns, and Holly is looking forward to a great year. Along with the new faces in the group, Holly and Dana Diemer began developing a series of horse shows at Portofino. The first one was in November of 2015, and in 2016 they are putting on shows February 13th, June 4th, and November 19th. These shows will offer combined tests, jumper rounds, dressage tests, and coming in June, a horse trials!!! Please visit www.portofinoequestriancenter.com for more details. Holly is excited to announce she will be adding another venue for lessons, Portofino Equestrian Center in Clayton, NC. Like Equiventure Farm, Portofino is a complete training facility with lighted sand rings, a dressage ring with mirrors, and a full cross country course. Both training facilities offer full board and care. Holly is lucky to train out of these two amazing facilities! Happy New Year! With the holidays behind us now, we are all very excited to get the show season under way. The weather has been a little rough, and I am definitely missing the winters I spent in sunny Florida! However, Equiventure Farm has new eventers, dressage riders, show hunters, and jumpers. Everyone is so excited to have such fun and eager people in to train and compete. Our facility is located in Rougemont, NC, and with a dressage coach, hunter trainers, and myself, it is a well rounded training facility! Good luck to all as they start their 2015 spring season! Now that the show season is beginning to wind down and the weather is getting cooler, I am still very busy with new horses and students. The teaching schedule has been in full swing, and the group is headed to a few schooling shows in October and November. As December is a quiet month for horse shows, a few of us will be headed to Ocala, Fl after the new year for shows and schooling this winter. We will be staying at Sandra Roberts facility right next to HITS! There will be options to cross country school, show at HITS, or compete in an event. While Equiventure Farm is my main training facility, I have branched out to a few other barns to accommodate my busy teaching schedule. But where ever I go, I am lucky to have such a great group of people to teach. Everyone has been so helpful in working around my family activities too. Hailey is now playing soccer, going to gymnastics, and will be starting up swim lessons again. The hardest part of my job right now is scheduling the weeks! With a 2 1/2 year old in full swing, life has been cruising at top speed! I have made the tough decision to sell my beloved horse Last Monarch. While I am still devoted to my coaching and teaching, managing my competitive career with a family was not in the cards. I love being a mom more than anything, and my family is #1. Alfonso Gomez Benet has purchased the amazing "Stewie," and will be traveling from Mexico to North Carolina throughout the spring to compete him. I will be overseeing the training and shows, and Stewie will ship out to Mexico at the end of April. I will be heading to Mexico in May for a clinic, and to help get them ready for the Central American Games. I am very happy to be a part of Stewie's future, and I wish he and Alfonso all the best! Summer is finally here and we are still busy as ever at Holly Hudspeth Eventing. Stewie ran his first event in over a year at Surefire in the OP, and finished 2nd. It was great getting back into the start box! Summer also brings back Eliza Granger, who has been a working student for the past 4 years. Allie Mestnik will be coming for a brief period too! I want to welcome new working student Liz Walter from Texas. She made her way out to North Carolina with her horse Gigi for the summer. These girls will be joining Maggie White, and I am happy to have such a fun crew. In August we head to Fairhill and Full Gallop, then onto 5 Points. The winter has sure flown by, and business has been very busy! Equiventure Farm is full with many new boarders who are eager to get rolling for the year. Eight of us travelled to Aiken to kick off the season, which proved to be a success. While I have been booked up with lessons and horses in training, Stewie is having a quiet spring, working on the farm. Our little girl Hailey has started a class 2 times a week. With her, and my fabulous students, my own competing has taken a slight detour for a few months. Two year olds are a bit of a handful! Holly Hudspeth Eventing will be having another clinic September 21-23 at Equiventure Farm in Rougemont, NC. All levels are welcome, and riders can choose exactly what they want to work on. Equiventure Farm has a sand dressage ring, full cross country course, and a large sand show jump course. There will also be a cookout Saturday night! Stabling is available, as well as camper hookups. for more information and forms, please visit our clinics page. Well summer is 1/2 over, and where has the time gone???? After a very busy spring and short break, we are all back in action! This summer I have Marina Royston and Eliza Granger working at the barn, and I am thrilled to have such hard working girls! They have been busy painting new jump poles, cleaning tack, moving jumps, and setting up the dressage ring. And their help is much appreciated. Hailey and I took swimming classes together at the YMCA, and had a blast. The girls and I competed at the Raleigh and Culpeper jumper shows with great success, and I look forward to more. After kicking things off with the CHP starter trails in July, in August we are heading to Fairhill and Full Gallop. My students are split this year between the AEC�s and 5 Points, and I want to wish everyone luck this fall! Lastly, I want to thank Tribute Horse Feeds for welcoming me into their Sponsorship program. I am honored to be working with such an amazing company, and I know Stewie is excited to eat the fabulous feed! This spring has started off great! Holly Hudspeth Eventing headed to Aiken, SC for a few weeks of training and competitions. Last Monarch, or "Stewie" has made his way back to the advanced level with a 5th place finish at Pine Top. Maxine Preston also conquered her first preliminary! Everyone has been busy training and preparing for the next line up of competitions which include SPHT I, SPHT II, The Fork, and Longleaf. And if all goes well, Stewie will make his return to the Kentucky Horse Park for the Rolex Kentucky CCI**** in April. Hailey is also making great strides as she has turned 9 months and is crawling all over the place. She has been attending the shows and is Stewie's good luck charm! Well our trip to Aiken was a huge success! At Full Gallop on Feb 1 Stewie was 2nd in the OP, Maxine was 5th in the OT, and Eliza was 8th in the ON. The girls both went back to Full Gallop Feb 8th, and had another stellar show with Maxine 6th in the OT and Eliza 5th in the ON. That following weekend Stewie was a super star, and placed 5th at Pine Top in the OI. After 2 weeks down south, we came back home Feb 10 to some cold weather! It is now back to training as Maxine and I head again to Pine Top for Stewie's first advanced run of the year and Maxine is set to tackle her first prelim. A special thanks to Chuck for supporting these past few weeks, and Sam Johnston and Katie Peoples who helped care for my two babies, Stewie and Hailey. We are getting under way after a nice break for the holidays. With cross country schools and the Pipe Opener at CHP January 21, it is time to get rolling! Our first few events looks like this; Feb 1 Full Gallop, Feb 8 Full Gallop, Feb 11-12 Pine Top and Feb 24-26 Pine Top Advanced. We will also be at both Southern Pines Horse Trials in March and The Fork in April. I want to welcome all the new students to Equiventure Farm. Liz Kiewalt, Mykal Roth, Charlotte and Becca Goodman, Liz Tillman, Vanessa Thornburg, Tracie Morano, and returning student, Christine Pavey. We are so excited to have such a super group of people! Holly Hudspeth Eventing is proud to announce two new sponsors! Holly is working with Legacy Equestrian Outfitters and their new horse boots, Kentucky Horsewear. Kentucky Horsewear carries cross country boots, show jumping boots, bell boots, and tendon grips. These boots are the latest in shock absorption technology, and have a stylish and durable design. Only Fools & Horses is the second recent sponsor, and is a new tack shop in Durham, NC. This tack shop has a superb variety of everything a horse enthusiast would need. Please visit the sponsorship page for more information on these two great companies. Holly Hudspeth Eventing is having the final clinic of the year, November 18-20 at Equiventure Farm in Rougemont, NC. It will consist of three lessons of your choice, and Saturday night's dinner will be another "crab boil" by the great chef Chuck Hudspeth. Additional clinic info and forms are on the "clinic" page. There will be another Holly Hudspeth Eventing Clinic at Equiventure Farm in Rougemont, NC, August 26-28! Come on out and fine tune for the fall season and meet new people at our Saturday night cookout. You can choose what phases you would like to work on, and pick your days to ride. It will be a great prep for Five Points HT the next weekend! The clinic forms can be found on the "clinic" page. Hailey Charles Hudspeth was born June 10th at 11:33 pm via c section, at Rex hospital in Raleigh, NC. She arrived with beautiful blue eyes and lots of hair. Her Daddy and I are so happy she is here safe and sound! Please check out the many amazing pictures of Hailey on Holly�s Facebook page. Holly Hudspeth Eventing has had a busy spring with multiple shows and clinics, and all the students and friends have been outstanding. Holly and Chuck are awaiting the arrival of their first daughter, Hailey Charles Hudspeth, who is due June 4th. Stewie and Freddie are back at home from their winter camps with Boyd Martin and Will Faudree. Both men are amazing horseman and riders, and we thank them for all their hard work with these two horses! Holly Hudspeth Eventing also joined forces with Cavalor Feeds and Devoucoux this year. We are so proud they are part of the program along with long time sponsor Prime Performance Nutrition. Please check out the "sponsorship" page for further details on all these super companies. We will also be holding another eventing camp at Holly's training barn, Equiventure Farm, sometime in August or September. Check back for further details! As many of you know, Chuck and I are expecting our first child. It is a girl, and we decided to name her "Hailey". She is due June 4th, and we could not be more excited! While I am not riding anymore, I am still teaching, and will soon be cheering on Stewie and his new rider, Boyd Martin. I dropped Stewie off at bootcamp December 16 along with Cold Harbor, and both will be out competing soon. Stewie's spring looks like USET training sessions, both Pine Tops, SPHT II, The Fork, and then ROLEX!! Boyd has been so great about keeping me up to date with how Stewie is doing, along with video clips and pics. And while I am dying to ask Boyd to Skype me weekly with him, that might be pushing it! Thanksgiving Classic Click here to read Holly's report from the Annual Thanksgiving Classic from the Carolina Horse Park, where Will Faudree rode Stewie in the Mini-Prix. 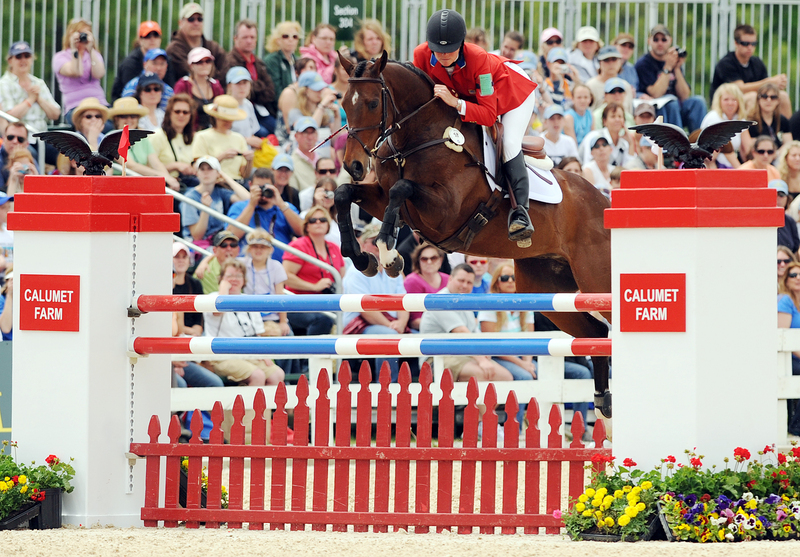 Holly and Stewie were named to the short list for the 2010 World Equestrian Games. The training sessions have already started and camp HCH is ready for the challenge! Stewie and Holly will head to Maryland, Millbrook, Richland, and the AEC's. After much anticipation for the last 2 months, Rolex is now over. And Stewie was a super star! Going in, my plan was to ride smart and take each day as it came. Knowing my horse was new to this level, I really did not know how he would handle the atmosphere. And he did not disappoint! We had a respectable 57 in dressage, a solid xc round, and left all the rails up in the sj! After being held on the xc, there was a discrepancy about the time. NBC and myself calculated 12 seconds over, and the timers at the stopping point had 29. Although it was frustrating, Stewie jumped the last fence as well as the first. I was also so happy he did not touch a rail on Sunday! It is so important to have a good show jumper in this sport, as much can be lost on Sunday. Thanks to Kaylie O'Neil, Cali Johnson, and Ashley Kriegel who did an amazing job all weekend! Stewie looked super every time he stepped out of his stall and I could not have asked to be around better people day in and day out. Thanks to Helen Murray and Eliza and Faye Woolf who gave a helping hand on xc day. Next is a big "thanks" to my good friend Teresa Foote who kept me fed and relaxed. Teresa was so great to have there and I really appreciate all she does for me :) It was also fun the have Stewie's previous owner and very good friend Jane Murray and her husband Tim there to cheer us on! And last but most important, my Husband Chuck. While during the stressful weeks leading up to Rolex he joked about putting Stewie on Ebay, he was my rock and biggest cheerleader all weekend. He had never been to Rolex before and was so impressed and sooooooooo proud of Stewie and I!! I am so lucky to have Chuck, he is the best! Click here to read Holly's latest entry in her blog of her and Stewie's path leading up to Rolex on Eventing Nation! Last Monarch seems to be on track for Rolex. He finished 5th at SPHT and 4th at The Fork. It was nice to be back on him after watching Boyd take over for Pine Top. He has been so consistent and we are all looking forward for KY! Stewie is so much stronger than last year and has really developed. 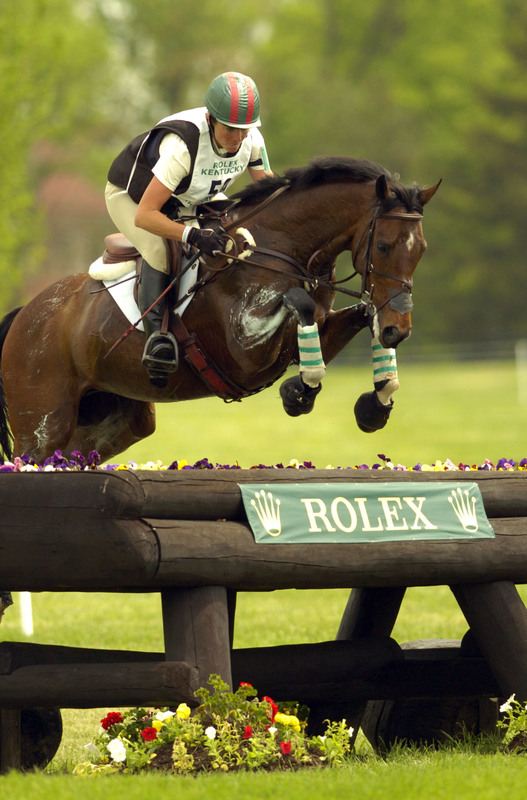 Check out our Rolex write ups on www.eventingnation.com. Working students Kaylie O'Neil and Ashley Kriegel have also had great outings this spring and are excited for the 1* and VAHT. Eliza Woolf is the proud new owner of Carrera, and along with Ying Yang Yo, plan to hit many events this summer. Kim Rushton, Ann Alexander, Marty Fisher, Lexy Pingree, Christine Pavey, have also joined our traveling eventing group and I wish them a super season! Well the season is under way! Due to nasty weather in NC we headed to Aiken for a few days before the first Pine Top to school and get a few lessons with Phillip Dutton and Silva Martin. And it all paid off. Last Monarch finished 2nd in the OI and Cold Harbor won the OP. It was great to get back into the swing of things! I also helped Ashley Kriegel who won the PR and Kate Berta who was 5th in the IR. Hats off to Pine Top Farm for being able to run with 5 inches of snow Saturday morning! The second Pine Top went well too, however, I was not riding:( Miss grace here fell off a ladder hanging a tack cleaning hook and sprained her left wrist. I would have sworn from the numbness and pain it was broken, but x-rays proved otherwise. So my friend Boyd Martin rode the 2 boys, finishing 6th with Last Monarch in advanced and 3rd with Cold Harbor in the Intermediate Horse. Bo's owner Dana and I were so happy with the job Boyd did, seeing as he rode both horses for the first time that weekend! Ashley Kriegel was 4th in the PR, having another great show. Kate Berta rode well in the IR division, but had a silly stop second from home. Now it is off for the SPHT competitions. Click here to read Chapter 1 of Holly and Stewie's path to Rolex on Eventing Nation.